King Dedede makes his debut in Super Smash Brothers Brawl. King Dedede, like Kirby, can multi-jump but he is heavier and bigger which makes it harder for him to multi-jump. 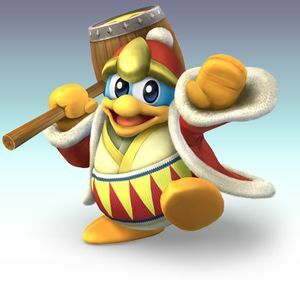 King Dedede has a lot of ranged attacks and also powerful attacks like a normal heavy weight, but he can float and inhale opponents which makes him an unusual character. His forward tilt is a very high ranged attack compared to its speed so it is usually a good attack. His up tilt is very fast and it is also powerful, so it is also a great attack to use. His forward smash is very slow, so it will be very hard to hit a skilled opponent with, altough if it works, it usually gets Dedede a K.O. since it has so much power in it. Down smash and up smashes are pretty good attacks, they are useful in different situations. King Dedede can also chain-grab by pressing down while grabbing, then dashing forward with another grab. King Dedede has no spikes in his aerials, and they are not that great overall except for his back aerial which is an excellent move. His forward aerial is powerful so it is useful for edgeguarding and K.O.s. Basic Hammer Does two hammer swings then does a hammer drill that can be continued indefinitely. + + + + Hammer Drill Spins his hammer in front of him. Has great reach. + + + + Head Bash King Dedede headbutts upwards. This move is awesome as it comes out fast, has good range and is very powerful. In fact, it's the second most powerful Strong Up Attack in the game, only beaten by Ganondorf's. + + + + Leaning Swat King Dedede leans down and kicks. while dashing while dashing while dashing while dashing Faceplant Falls over, crashing in to his opponents. This move has severe lag but it is also very powerful, killing at around 100%. Smash + + + (Smash + ) or (Smash + ) or Hammer Smash The most powerful forward smash attack in the game, Dedede slams his hammer in front of him, dealing massive damage. The trade-off is that it take a long time to execute. It's strong because it has both the second higest base knockback and the second higest knockback scaling out of any forward smash. Smash + + + (Smash + ) or (Smash + ) or Hammer Arch He swings his hammer above him. It isn't very strong (in fact, uncharged it's weaker than his up tilt), and it has high ending lag. Smash + + + (Smash + ) or (Smash + ) or Hammer Spin He spins, hitting with his hammer. It's strong, and it lacks the start-up lag of his forward smash and lacks his up smash's ending lag. King Dedede is known for having one of the best grab games of all the fighters. He has the best grab range of all non-tether grabbers. His Down Throw chaingrabs most of the cast and even infinites some. He can also infinitely chaingrab anyone heavier than Marth against a wall, making stages like Shadow Moses Island Dedede's heaven. after grab after grab after grab after grab Royal Headbutt Headbutts the opponent. after grab after grab after grab after grab Forward Bash Hammers his opponent forwards. This move is great for ending a down throw chain. after grab after grab after grab after grab Backwards Bash Hammers his opponent behind him. This is the most damaging throw and is one of the strongest throws knockback-wise. after grab after grab after grab after grab Dedede Hurl Hurls his opponents upwards. after grab after grab after grab after grab Broken Sitter Dedede sits on his opponent. This is the move Dedede is known for. This move has set knockback, which means it can be used to chaingrab most characters. It can even be used to infinite some characters, but high level tournaments usually ban it. Inflate King Dedede inflates himself, hitting opponents close to him. + + + + Hammer Swing Swings his hammer in front of him. This can be used repeatedly if your opponent is at low percentages. + + + + Dedede Kick Kicks backwards. This move is great. It is very useful for edgeguarding, approaching opponents...anything actually. Use this move as much as you can, it never hurts. + + + + Upwards Drill King Dedede spins his hammer above him. + + + + Downwards Drill King Dedede spins his hammer below him. Inhale Dedede is able to inhale opponents, similar to Kirby, although he is unable to swallow them. Dedede is able to spit the opponents out very far as stars that do damage to other players hit by them. It's also possible to inhale items - but just like with Kirby, Wario, and Yoshi, avoid explosives or they will damage you! + + + + Waddle Dee Toss The king throws Waddle Dees to the opponent. After thrown, they walk over the stage. Occasionally he throws Waddle Doos and even Gordos. Waddle Doos shoots a trapping beam attack while Gordos powerfully smashes anybody in its way. + + + + Super Dedede Jump He jumps really high and lands really hard. But be careful because you will be vulnerable. To cancel the jump tap down on the Control Stick, but with this you will be more vulnerable. + + + + Jet Hammer King Dedede's hammer is mechanized, so you can charge it up and blow away opponents in one shot. This move cannot be saved, like Donkey Kong's charged up fist. If you charge it for too long, it will cause one percent of damage to King Dedede every second until you activate the attack. He holds his hammer up and twirls it. + ( or )+ or or He turns toward the camera and twirls his hammer sideways. + He does a little spinning dance. Waddle Dee Army: King Dedede summons a army of Waddle Dees, Waddle Doos, and the occasional Gordo, to attack players, doing around 8-10% Damage each. However, beware that they can be stopped by some attacks and items, like the Smart Bomb. This Final Smash, on larger stages, can deal major damage or be completely avoidable (characters with the ability to float should have little problem against this). Since this final smash has little chance of KO'ing an opponent (only a few Gordos spawn during its duration) it's mostly used to raise everyone's percentage. When it's finished, hopefully it will have benefited you enough to where a single smash attack can reward you with a KO. Note that Dedede is completely invulnerable throughout the final smash. This matchup is laughable if infinites aren't banned. Just find an opening in DK's attacks and then grab him. Then, proceed to chaingrab him infinitely. DK's large size means you don't even have to move much. Just move a little forward and grab again. If infinites are banned the matchup is a little bit harder. Donkey Kong and you will be spamming Back Airs, as it is your most useful attack. DK has to approach you because he has no projectiles. Your grab range outranges his, and so does your Back Air (though it is minute). You and DK both have an abusive range in all your attacks so that is not a problem. Watch out for spinning kong or ground pound as they rack damage quickly and are hard to escape. When it comes to KOing, DK has more options but yours are fast and powerful. Overall a fun matchup, play carefully and you won't lose. This page was last edited on 12 February 2015, at 14:50.